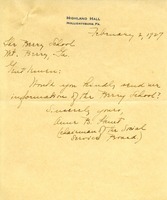 Letter to J. Edmund Hill from Martha Berry informing him that she has received his letter and that she, as well as the boys and girls attending the schools, would love to have him visit. She also informs him that she is having him put on the mailing list and that she is sending him some literature with information about the schools in it. 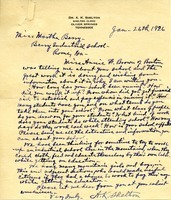 Martha writes to Mrs. Carpenter with literature about The Berry Schools and some brief history about the schools. The Berry Schools inform Mr. Ketchum that the records he requested about the careers followed by Berry alumni would be difficult to collect while so many people are out of the office. They enclose a packet of general information about the school and say that further records can be obtained for him later. They tell him that that most students return home to work or marry after they graduate, excepting a small percentage of girls who are hired on at the schools. The schools also inform him that many others go to college after completing their high school work and Miss Berry is establishing a Junior College for those such students. She is also working on establishing a bookkeeping and stenography course for college sophomores. They encourage him to write with any more questions. 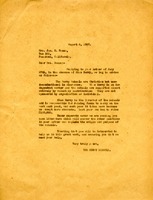 The author asks the recipient to send information about the Berry School. 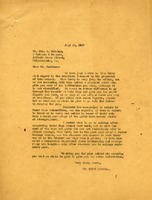 The Berry Schools write to Mrs. Hanna while Miss Berry is away with information about how the school is run and a little background of the school. They also writes under separate cover literature about the school. Dr. Shelton asks Martha Berry for information about her school and how it works and was established because he sees a need in his area of the country. 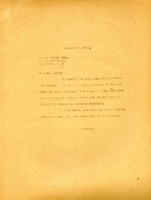 Emily V. Hammond asks whether R.C. Eldridge is on her list -- he sent his "prize" and would like to receive information about the schools occasionally.